Arthur Dewald, 94, Jamestown, ND died Wednesday January 16, 2019 at the Jamestown Regional Medical Center. He and Tillie Mertz were married June 28, 1945 at Napoleon, ND. They made their home west of Streeter on the Dewald’s home place where they farmed until 1980 when they retired to Jamestown. They enjoyed traveling, bowling, golfing, fishing and playing pinochle; following Tillie’s passing in January of 2006 he continued to reside in Jamestown. Art and Alma Ruff were married September 1, 2007 at Jamestown, ND. Art was involved with the St. Luke’s Lutheran Church Council and cemetery board, school board for German School District, Farmers Co-op Committee and the Peace Lutheran Cemetery Board. 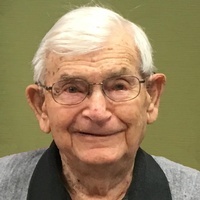 He was a past member of St. Luke’s Lutheran Church in Streeter, Atonement Lutheran Church, Jamestown and a current member of the New Hope Free Lutheran Church in Jamestown. He was also a member of the Eagles Club, men’s and mixed bowling leagues and the Lutheran Brotherhood. Art is survived by his wife Alma, Jamestown, ND, 2 daughters and sons-in-law, Arlyce (Harold) Klein and Kathleen (Jim) Brunner, all of Jamestown, ND; 4 stepchildren, Daphne (Don) Kane, Fargo, ND; Claudia (Ritch) Wolf, Jamestown, ND; Wade (Kathy) Dewald, Urbandale, IA; Doreen (James) Mickelson, Audubon, MN; 7 grandchildren; 15 step-grandchildren; 12 great grandchildren; 18 step-great grandchildren; 2 step-great great grandchildren; and 1 brother, Edwin (Marilyn) Dewald, Dilworth, MN. He was preceded in death by his parents; 1 brother Eldo Hillius and 1 sister Elsie Janke, and 1 step grandson.